Travel to China in the latest hidden-object adventure! Rumors of an unknown dynasty surfaced when ancient tiles turned up on the black market. 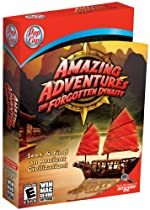 Your mission is to explore China and search for clues to uncover the secret of the Forgotten Dynasty. Visit 25 exotic locations as you search for more than 2,200 hidden objects. Explore more than 100 levels and find the hidden Yin and Yang symbols to unlock 2 bonus game modes. Solve 9 unique mini-game puzzles and discover fascinating facts in your journal. You can even play in Relaxed Mode and seek-and-find with no time limits.